Welcome to a new series I'll be starting here on The Broketographers "Modifiers". We love using and shaping light in nearly every shoot. Having control of what essentially makes your photo (remember, at its essence, photography is quite literally just capturing light), gives you many more options for making your vision come to life. In this series I want to cover different lighting modifiers that we own, borrow or rent, their application, and of course, the results. At the end or at some points during the series, I'll be doing a wrap-up or comparison between recently covered modifiers so you can get a feel for what each one does compared to the others. Every modifier has its place, but often the same result (or similar) can be achieved for much less! 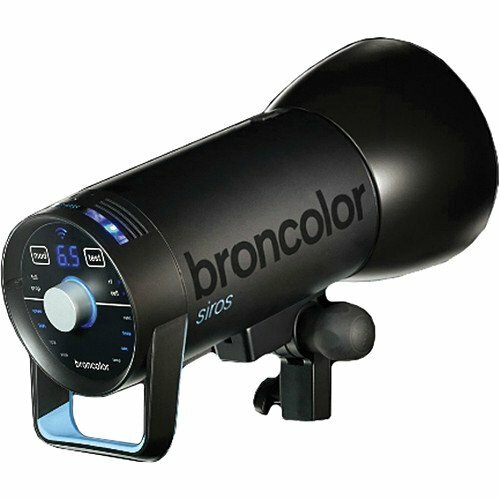 Having said that — and perhaps a little counter to what I just said — let's start with what's fast become one of our favorite modifiers — the Broncolor Para 133. 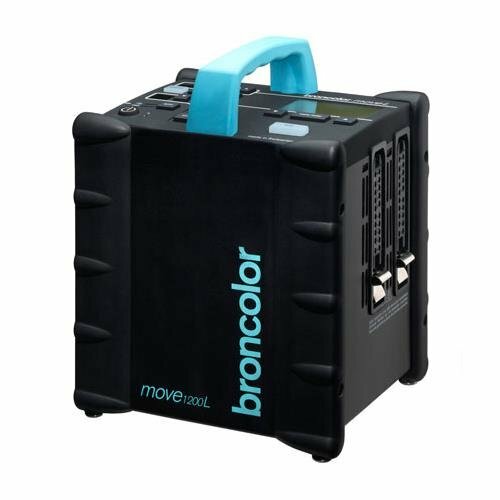 The Broncolor Paras are considered a "holy grail" modifier, usually because of the exorbitant price. But what do you get for the money? Here's a shot straight out of camera using the Broncolor Para 133 and a Move 1200L pack and MobiLED head, positioned camera left, and very slightly above the subject. The thing I probably appreciate the most from this modifier, is that it's almost foolproof. Provided you get your exposure the way you want it, the results from the Para 133 are quite unique. It sets up extremely quickly, and when you're shooting 30 portraits in a day, see the results, how easily they were achieved, and how much time is saved in post, it's easy to appreciate the time something like this saves you — and easy to forget about how much it all costs. So, how does a parabolic modifier work? Firstly, parabolic modifiers are indirect light sources — that is, you shoot your light source into them, like you would an umbrella, rather than through them, as you would with a softbox or reflector, which are considered direct light sources or modifiers. The goal of direct lighting is to "soften" or otherwise improve or shape the origin light source through creating a larger light source or diffusion. The problem with traditional modifiers is their uneven spread, and hotspots originating from the source of the light (commonly the center of the modifier, where the light is mounted). Further, the diffusion (usually "double diffusion" through an inner and outer diffuser present in most softboxes) creates its own issues with regard to quality of light. Through the constant diffusion and scattering of light rays, the light is very soft, sometimes creating an unnatural look with detailed textures as in the case of skin or fabric. To overcome these issues, many photographers will only use the inner diffusion on softboxes to add contrast and texture, or "feather" the softbox into the subject to achieve more contrast. Beauty dishes remedy this somewhat through its use of a plate to reflect the light source back into the dish before being directed back out to its subject, however size and transport is often a concern with beauty dishes, especially larger ones, like our Mola Setti (seen below, and which I'll cover in a future post). 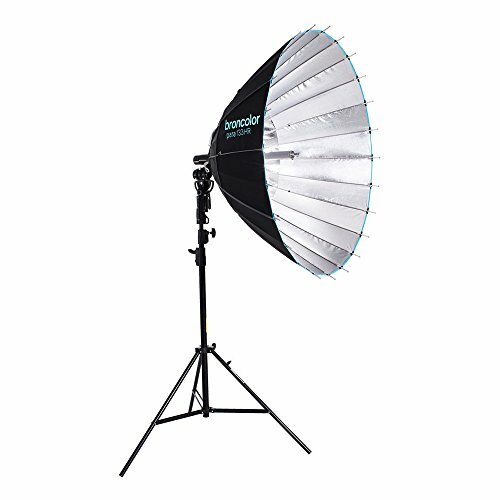 With indirect lighting, in the case of an umbrella — or in this case, a parabolic umbrella, you shoot the light source into the modifier rather than onto your subject. When you do this — at least with a true parabolic reflector — the light's rays are collected, collimated, and then reflected back onto your subject for a more smooth, even spread of light, eliminating any issues with hotspots as you would from a traditional modifier. Because of the parabolic shape and design of such modifiers, you can position the light at different points in the parabola to achieve different lighting effects and qualities of light from a single modifier. The price of admission may be high, but it could potentially replace a beauty dish and all your octaboxes. Broncolor offers different diffusion panels for the paras as well, so you can achieve a more traditional soft light look if so inclined. A grid is also offered. Time-saving isn't limited to just setup, though — because of the unique qualities of light that the Para 133 exhibits, you will often save time in post. Images straight out of the camera deliver unmatched detail and contrast, especially with regard to fine, detailed textures like skin and fabric, making the Para 133 (or any of its size variants) perfect for any detail-oriented photography such as fashion, product or portraiture. With portraits, skin texture is exquisitely reproduced with detail that you don't often get from any other modifier, and the soft fill provided by the Para contours subjects nicely. The versatility and quality of light from a parabolic reflector are reason enough for anyone — budget permitting — to invest in one. Time savings, versatility and incredible results are all reason enough to look into investing in a Para if it makes sense for your subjects and style of shooting. While I recently also purchased a Para 88 to complement the Para 133 (I'll get into that when I do a Para 88 post), this post is about the 133 specifically. I purchased the 133 specifically because it seemed like the best balance between price, size, and setup. The larger Broncolor Paras like the 177, 222, and the gargantuan 333 setup differently than the 88 and 133. They setup with a crank mechanism, that is just as easy, but obviously will require much more space, and maybe even a helping hand (or two). Since I do not currently have a dedicated studio space, I needed something that would setup, transport, and breakdown easily, without being too big. While researching the differences between the Para 88 and Para 133, my biggest concern was subject coverage. A larger modifier will more easily cover a larger area without sacrificing any qualities of the light or increasing contrast (remembering that as a light becomes smaller relative to the subject, as in the case of moving it closer or further from a subject will render the light more 'harsh'). Most posts I had read said that while the 88 is capable of full-length portraits, the 133 is better suited for the job, while also being capable of doing close-up work with the right positioning and focusing. Since I often do 3/4 to full-length work, The Para 133 seemed like the logical choice. The Para 133 is easily capable of evenly lighting a full-length portrait. Each Para is comprised of 24 panels of highly reflective fabric — the number of sides and the fabric is important for a few reasons: more sides means a rounder shape and a more pleasing and natural looking catchlight for people work (the reason octaboxes and beauty dishes are popular in portraiture). This, combined with the highly reflective fabric means more point light sources when defocused — the reflectiveness of the fabric essentially creating a hard light source of each panel, which is in large part responsible for the detail-enhancing specularity of the modifier. As you can see above, the Paras are much deeper than the average modifier -- the Para 133 is 30" deep (the Para 88 is 24" deep), and that depth is what creates the parabolic shape and is part of the unique quality of light — and also what allows you to "focus" the strobe head in and out of the reflector, creating different lighting looks in a short amount of time with a single modifier. When defocused (or "flooded"), the Para exhibits an almost ringlight effect on its subject with the catchlights to match -- this is achieved by the strobe filling mostly the edges of the Para, creating a halo of light, but also offering some light fill via the middle of the para, as a result of the shape and depth of the modifier. In the middle position, the Para offers a nice mix of contrast and the outer edges fill in the contouring provided by the center, so it's not too contrasty. This is great for fashion work. When fully focused (or spotted), the depth creates a contrasty, hard light, but the periphery of the modifier still offers some fill as light exits the modifier. Focusing a para also increases its light output by about 1.5 stops, due to the focused light coming out of it, so be sure to adjust power or aperture accordingly. An interesting note about Paras — Paras don't "feather" as softboxes do — they light with the far edge and can create additional unique looks, all their own, depending on how they are aimed at (or away from) the subject. The following 3 lighting looks were created simply by turning the para away from the background, toward the background, and finally straight at the subject, at a slight downward angle, while leaving the para in its original position. As far as I'm concerned, you could use a Para in nearly any application. The Para 133 is so versatile because of the ability to focus or defocus the light and get different lighting looks quickly and easily; Additionally, with available diffusion fabric, you can easily create a quality of light similar to a traditional octabox if so inclined, or further control the directionality with a grid. However, the quality of light coming from a Para in the fully defocused position is nothing short of magical -- the combination of both hard and soft light brings out texture and contrast that's often subdued or "washed out" by normal softbox/direct light-type modifiers. There is a small learning curve to using the Para, though — placement is key in achieving the look you want — Even the slightest change in angle or direction can change the look entirely. While the basic properties like angle of light apply when placing or controlling where shadows fall, feathering works a bit differently with a Para than it would a normal softbox. Finding different ways to "aim" a Para only adds to its versatility, in addition to its focusable design. If I had to pick a "desert island modifier", a Para 133 or Para 88 would most definitely be it. Below are a few more straight out of camera results with the Para 133. Viewed at full-res, you'll notice the amount of detail rendered in the skin through the use of the Para. This makes these modifiers perfect for beauty or fashion, as they bring out all of the natural texture and detail, which can often be lost with other modifiers. On the right is another straight out of camera shot, again with a Profoto B1 gelled with a CTB gel into a defocused Broncolor Para 133, and a gelled Profoto B1 as a rim light. The other B1 with a strip bank was used as a makeshift flag to control flare and spill. Below is the Para 133 being used in the mid-focused position as the only light on location. In the straight-out-of-camera shot further down. note the texture, detail, and shadows in the moving fabric behind the model. For fashion or location work, I prefer the look this gives, as it accentuates features and details. Also note how even the illumination is for the area covered by the strobe in the BTS shot(s). I prefer the 133 for full-length shots (of which is it entirely capable), but I usually use the Para 88 for anything less than full length, because of its smaller, more manageable size. The 88 is capable of lighting full-length, at the right distance to subject, however.